Boucher & James,Inc. Engineers New State Police Barracks for the Poconos Region - Boucher & James Inc.
On June 13, 2017, hundreds of people attended a dedication ceremony for the New State Police Barracks on Rimrock Road in Hamilton Township, Monroe County, PA. The new state-of-the-art Barracks is now open near Stroudsburg and will be home to more than 80 state troopers. 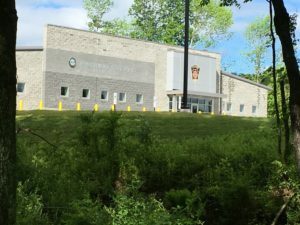 Boucher & James, Inc. prepared the engineering plans for the new 17,412 square foot State Police facility. The project included site improvement plans, land development approval, NPDES and PennDOT Highway Occupancy approvals and permits. Work began on the project in the Fall of 2015 with approvals secured in the Spring of 2016, construction commenced shortly thereafter. 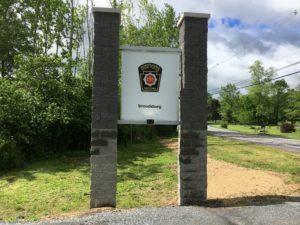 The overall project included the Police Barracks with room for future building expansion, a vehicle impoundment area, parking areas, site utilities, stormwater infiltration basins, and related facilities. Boucher & James, Inc. is proud to have been selected to provide required engineering services for this important regional project.